Let me be candid right from the beginning—I’m single and I don’t have any children, so I’m not the most qualified person in the universe to talk about them. If you’re a parent, you’ve probably never thought to wonder what a single person thinks about children. I certainly understand that, but let me offer an argument for why having children around is one of the best things a single person can have in their life. Let me propose that the consideration of children should be a part of every believer’s life, not just the married ones. I went to Moody Bible Institute in Chicago. In my four years of college, I really can’t remember having a single interaction with a child. I never saw them. There were certainly married students there, but they had their own building. They also must have had their own underground tunnels for shuttling their children from place to place, because—honestly—where were they? It’s not just a college university thing either; big cities are strangely absent of children. I remember seeing a few of them running around the parks, but the city keeps them mostly cordoned in what I can only imagine are large industrial-sized playpens. I didn’t necessarily relish the fact that I never saw kids. I just didn’t think about it, ever. Now you might be thinking this is an ideal situation. What college student wants loud little rowdy kids disturbing their attempts to pick up women at the campus coffee shop? And what mother wants their children around college students, of all people? It does seem ideal, I guess, this world where college students can go on with their lives without ever considering children. Ideal, yes, that’s what I’d call it; but, this is something I’ve learned about life—maybe you can agree with me here—life isn’t ideal. If you want to learn how to live, you want to avoid artificial partitions at all costs. Once real life happens and all bets are off, you realize it's more important to develop the character necessary to manage the difficulty of real life, rather than working to create an artificially easy life. In Stories class, Ben teaches about the basic components of good stories. Benjamin Reese shares his love of stories and literature at the GOD Elementary school. There’s this story where the children all come to Jesus. You’ve probably seen it depicted in quite a few paintings. The disciples, of course try to stop them. (Just what young men would do, am I right?) We usually don’t reflect on this story. Usually it’s just used to show that Jesus was a really, really nice and gentle guy—so nice he was even willing to take some time out of his busy schedule to hold a few kids now and then. But, Jesus’ rebuke to his disciples shows that his reason for allowing the children to come was rooted more in his theology than his congeniality, “For it is to such as these that the kingdom of God belongs” (Lk. 18:16). The kingdom of God was the thrust of Jesus’ whole ministry, so its no small thing that Jesus names children as the primary recipients of his work. I don’t think it’s a plug for childhood evangelization. I think it's stating a reasonable fact. The world we make is the world children are going to live in. Jesus was creating a new world among his disciples, and these children were to be the beneficiaries of that work. Earlier in Luke, Jesus says, “Wisdom is justified by her children” (7:35). A world is only as a good as the children it produces. Isn’t this the wake up call many parents get, an awareness that their decisions will resound into the lives of their children? If the kingdom of God is something that comes to earth, then we have to consider the ones that will inherit it after we leave. If we can’t enter into the kingdom “as little children”—if little children don’t have a place in God’s kingdom—then it’s not God’s kingdom. I am very glad that our organization values the consideration of this reality. I don’t have the luxury to ask myself, "How does the life I’m living work for me?" I have to ask whether or not the work I’m doing is good for the children that will inherit the product. This is real life—all fake partitions aside. The kingdom of God cannot come if you don’t consider the next generation. Recently, I’ve begun teaching at G.O.D. Elementary School. My life is quite different now. I used to live a life without making any of the considerations you have to make staring into the eyes of eager 8-year old students. The city would make us believe that the world runs more efficiently when you shove children to the side. That may be true. The world might run more efficiently, but it won’t run more humanely. No, I’m no expert on children, and I’m sure I’ll learn a lot when I become a parent. But, I’m glad to have them around, because every day—as I work, study, build relationships, make decisions—I do it in the presence of those who will inherit the consequences of my activities. I’m still single, and I still have the benefit of going home to a quiet house. I’m not trying to be a parent when I’m not. But, I don’t live my life like children aren’t a reality. When I see children looking up to me, I consider the kind of person I want to be, the kind of example I want to set. When I hold a child, I think of the kind of world I want to give to them. This gives meaning to my work, and it gently nudges me away from the insane myopia that my demographic seems to revel in. So, I say, let the children come, with all their energy, rowdiness, and craziness. They can trample, climb, and scream through my life all they want. "Hopewell Gardens" is the community garden of G.O.D. Intl. It is currently 7,000 square feet, growing nearly 50 different varieties of vegetables, with berry bushes and fruit trees growing along the perimeter. There are no chemical fertilizers used, and no technological short cuts taken. Each bed was hand dug with shovels and spades by community volunteers. Hopewell Gardens is an incredibly productive place. In 2012, it turned out nearly 3,000 pounds of produce, and this year is promising to yield even more. The fresh produce services the G.O.D. community, as well as many neighbors in Hopewell. Several local restaurants have also become loyal customers, and they are the newest vendor at the Donelson Farmers’ Market. Behind each tomato, cucumber and zucchini harvested in Hopewell Gardens, there are lives being cultivated through the rhythm of the garden tasks. All the single students of the Institute participate in weekly garden shifts. They are faithful all year long to help tend to the needs of the garden throughout the seasons and they contribute directly to the success of our agricultural endeavors. But the summer brings an influx of activity to the garden. 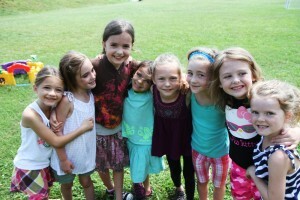 In the first two weeks of June, we facilitated Camp Skillz for lower-income children in the Nashville area. This brought 50 kids to the garden, many of them for the first time. A summer camp for the children of our organizational employees, Camp Kaibigan, brings another 20 on a weekly basis. In its busiest summer to date, Students Living A Mission (SLAM) is bringing over 600 children to work with our organization. Most of them will work in the garden in some capacity as an experiential learning tool. Do all these hands benefit the garden? Usually. But our biblically-derived ethics focus on the benefit to the individual as well. When 40 middle school kids come to spend an afternoon working in the garden, there will likely be more time spent instructing them and helping them work as there will be time for them to be "productive" in the garden. They may lack the energy or drive to work hard in the summer heat, and likely they have never gardened before. We teach them about the process of growing food, and help them try it out. Our hope is that they will become inspired to serve and learn based on the stories we teach them from the bible, and by the examples we give with our lives. “The vast majority of kids that show up haven’t had any interaction in growing food,” reflected Seth Davis, director of Hopewell Gardens. “Our culture separates us from the source of our food. Having students work the ground is educational in a practical way, as the kids learn where food comes from, and how it grows. But it also connects them to people around the world. The regions we work in—Southeast Asia, India, Latin America and East Africa—are primarily agrarian societies, and growing food is a part of their daily reality. When their crops fail, it directly affects their families. Last week, Seth spent time getting to know a SLAM participant as they bundled garlic together for an hour. The student was a football player with an injured knee, and Seth spent that hour investing in him. “We talked about things that I wish I would have known when I was his age,” Seth said. It was a productive time in many ways. We aren’t intended to serve the ground or worship the earth. We tend the ground and cultivate it in such a way that it preserves the lives of human beings, those created in the image of God. But nutritious food produced by the garden isn't the only benefit to a human life. In the garden, individuals learn about hard work, food production, creativity, innovation, and about life itself--a rare and precious experience for youth today. In this way, we aren’t just growing a garden, we are developing people. This is our practice in Hopewell Gardens. Kristina Davis is the wife to Seth, and the mother of three. Her children have all benefitted from working in the garden with their parents. They have learned not just about growing food, but gathering it, preserving it, and cooking it. Kristina also teaches classes in the NOVA Childbirth Education program, where she has a nutrition emphasis. Did you know that we do all of the maintenance, renovation and construction work at the G.O.D. International headquarters ourselves? We do not 'hire out' or bring in special cleaning services. Instead, we depend on the willing hearts of volunteers who are ready to serve. From the community garden to scrubbing bathroom toilets, to electricity work to building an amphitheater, every project we do, we do ourselves. This isn't only good for labor costs, but we believe it is helping individuals grow both in character and in skill, learning how to work hard, and work well. This video is a quick look into what projects we are undertaking this summer. GOD Int'l Grounds Volunteering from G.O.D. International on Vimeo. In 2011, G.O.D. Int'l started five businesses in order to meet three specific goals: to generate funds for the support and operations of our development work, to offer employees 'real-world' experience and opportunities to learn skills that will allow them to be a benefit to the people they serve, and to provide a healthy and safe working environment for employees. Learn more about the businesses in this video. Businesses Snapshot Video from G.O.D. International on Vimeo. G.O.D. International sent three families as representatives to El Salvador this February. The Johnsons, Reyes’, and Watsons recently moved into three houses and are currently making them into homes and getting to know their neighbors. Michael Johnson, an accountant for G.O.D. International and skilled in working with his hands, shares a moment when a seemingly small task evolved into an opportunity to help three fatherless boys tackle their first construction project. The World Health Organization calculates that in 2010, approximately 287,000 women die every year while pregnant or giving birth, and 3.1 million newborns die in the neonatal period (the highest incidence occurring around the time of the birth, and the majority of deaths in the first 24 hours). In the developing world, only about 58 percent of all deliveries are reported as attended by skilled health providers--in some countries, the figure is closer to 10-12 percent. And in many cases, the woman does not have access to life-saving emergency care should something go wrong. Of all maternal mortalities in the world, 99 percent occur in developing countries. Sub-Saharan African and Southeast Asia account for 87% of the world’s maternal deaths. After journeying almost 2500 miles south from Nashville, this year’s Students Living a Mission interns from G.O.D. Int’l didn’t miss a beat in jumping in to embrace the people in communities surrounding San Salvador, El Salvador. Having developed a children’s educational camp called Camp Skillz that they facilitated in Nashville for marginalized children, the interns translated this into Spanish and provided a dynamic week of educational activities for the children in a community called Sitio Nuevo. Outside of the Camp Skillz, the interns assisted in building projects on the property of G.O.D. Int’l in the community of Sitio Nuevo where homes are being built to house our development workers. The interns stayed in host homes in the local community where they became more acquainted with families and the home life in Salvadoran culture, and even had the opportunity to do work alongside locals in their daily responsibilities, like cooking, carrying wood and landscaping their properties. This has assisted greatly in helping our organization at large to develop a rapport with the people in Sitio Nuevo. Interns were also given the opportunity to visit a local orphanage where they spent time interacting with the 50 boys and girls who call it home. The interns had the opportunity to sit and learn their stories as well as encourage them with a production of skits and songs. Due to a variety of circumstances, schools in El Salvador are often without enough teachers. Due to this reality, the interns were able to spend a day assisting in a local school teaching English classes and interacting with students. On top of assisting with the school system, the team was able to learn how to identify public issues that exist in various small communities and what the causes were for these issues. Interns were introduced as to what it really looks like to come alongside the poor and marginalized and empower them to transform the environment in which they live. Over the course of their time in El Salvador, the interns also accompanied the band UnNamed Servant as they play different venues in El Salvador on their summer tour. They assisted the band in setting up and tearing down equipment before and after the shows. As the band ministered to the people through song, the interns had the privilege of engaging those who listened and were eager to learn and see justice done in the world around them. Continue to pray for this summer’s interns as they have debriefed from their time in El Salvador through facilitating a week of service projects in North Carolina for those in need in the city of Raleigh and have now made it back to Nashville. When I came to El Salvador to spend a summer immersed in the culture, I had not yet committed to serving in Latin American long term, nor had I developed a particular area of expertise so that I would even know HOW to serve the people here. Because of this, much of my experience in El Salvador has just been taking it in--observing needs and experiencing the culture firsthand; much of my experience in El Salvador has consisted of merely seeing and experiencing. I knew that it was possible to come to this place and still not see the reality that exists here. I made it one of my goals to keep my eyes open, no matter what things I was confronted with. As might be expected, most of my activities have had to do with interacting with women in El Salvador. I have cooked meals with Carmen, a neighbor who spends hours of her day in a hot, dark kitchen cooking over an open fire. She laughed at me as I awkwardly patted tortillas into shape and nearly cut a finger off dicing potatoes in my hand, as she doesn’t use a cutting board. I have walked and talked with Sonya, a 13-year-old in the midst of the transition from girlhood to womanhood, already taking on responsibilities far beyond her years. Sonya's school attendance is sporadic, as she often works in her family's corn fields and looks after her two younger sisters in the afternoons. I have played soccer with girls who would be my peers, and marveled at their endurance. I’ve participated in a seminar on self-esteem for women in a co-op, and listened as they expressed with embarrassment that they couldn’t participate because they’d never heard of the term self-esteem before. I have watched as women in their 20s signed their names by dabbing ink on their thumb and pressing it to the paper, because they could not read or write. These moments are precious opportunities to be made mature and complete in the LORD, not lacking in faith, but ready for those challenges that lay ahead. I don't want the difficulty of the things I have witnessed to lead to fear and despair, but rather I believe with the writer of the book of James that with faith, I can persevere and even become a helpful friend to these people. Such hope believes that with the guidance of God's word we can be a transformative people, taking an active part in building a new reality for these women and children. In 2008, with a backpack, my guitar and $50 in my pocket, I boarded a plane to Nashville. My parents had faith enough to recognize the LORD calling me and trusted him to take care of me as I moved over 7,000 miles away. After spending several weeks on a Summer Internship with G.O.D. Int’l, witnessing extreme poverty, injustice, and despair, I was hungry for the word of God. I didn’t know how the Lord was going to do it, and I didn’t feel like I had much to give, but I was more than willing to join Jesus in his mission to take care of the least of these. I was unsatisfied with the options that the life had presented me. Sports, military service, music, or an education that would leave me indebted for a number of years. However, I knew the LORD wanted to work with me and I was willing to do whatever it would take to learn his word and to know him more. This is why I moved to Nashville to join G.O.D. Int’l in their work. Joining this organization has meant becoming a diligent student. Becoming educated in God’s Word and learning about myself has not been the easiest journey. Learning how to be of benefit to others is humbling because sometimes you recognize the deficiencies life has dealt you, and the reality that you must overcome them before being of service to others. I realized my low reading comprehension and constant writer's block were because my literacy skills were far below what they should have been at a college level. The education I had received prior had not taught me critical thinking skills that would aid me in evaluating and recognizing the layers within texts that I was reading, and this seemed debilitating. Now, 4 years later, I am actually helping others develop critical literacy skills! I didn’t think that this could be done, but God is good, and does great work in those who are obedient and willing to learn. Since being at the Institute for G.O.D. Int’l, I have been able to take classes that will prepare me for teaching literacy amongst marginalized peoples in the Philippines. I have also worked with a few individuals on their personal reading and writing skills. Being able to read and write is something that makes my heart beat, and I am thankful for every opportunity I have to help others with these skills. My journey continues. I want to continue to become a person competent enough to help others develop the critical literacy skills necessary to begin to tell their own stories, giving them an identity and a history, and enabling them to contribute towards the transformation of their world with their words. I have been empowered. And as I continue to receive and grow I know that I can be a person who has more to offer the world than what money can buy: me! Similar to previous years, Summer Internship began here in Nashville, allowing for the interns to bond together while meeting needs of others and learning to depend on the Lord themselves. The interns facilitated a camp for underprivileged children and youth in surrounding areas titled ‘Camp Skillz.’ The interns were stretched physically and mentally, as each person’s creativity was necessary in organizing the camp’s events and activities. Grant Dailey, an intern and student at the Institute for Global Outreach Developments, explains, “Over the past two weeks I have been a receptionist, a teacher, an actor, a disciplinarian and even, a mummy. The list goes on and on.” Dailey mentions that each intern had to fulfill numerous roles within each day, in order to help the camp run smoothly. ‘Camp Skillz’ was a great success, giving healthy alternatives to the participating children--many of whom would not have benefitted from any other camp program had this outreach not been initiated. After two full weeks of exhausting hours, endless planning, lessons learned and treasured moments with the Camp Skillz participants, the interns prepared for their departure to El Salvador. The departing process to El Salvador, unlike other trips and internships, lacked flight numbers, baggage claims and airports. The interns were to join the band Unnamed Servant, and their families on a lengthy road trip to Latin America. Although the bus and vans pulled away from the building on July 4th, the entire day prior was spent preparing and finalizing all tasks before leaving the country. The community of G.O.D. Int’l, the band members and their families and all the interns shared breakfast together before the vehicles were loaded. Backpacks lined the hallways, as the communal itch of anticipation grew stronger and stronger as each minute felt like five. As bags were placed into the trailers behind the vans, the departure felt near. After a time of prayer, the interns stood before the community and stated what their hopes were for the trip, what they desired to see happen in themselves and the people around them. Bags packed, people loaded, doors shut and engines on, the bus and vans pulled away from the building around 12:30 PM. With shared experiences and team bonding moments behind them, the interns rested their heads on the seat backs and buckled up for the long drive to El Salvador. The first few weeks of internship--the memories made, friendships fostered, prayers lifted, and hearts focused--set precedent for the rest of the trip. This serves as a necessary foundation to achieve the hope of being of benefit to those who are often forgotten, this summer, in El Salvador specifically. We are grateful for our interns and the lessons they have learned in how to work together and trust in the Lord even in the midst of challenging circumstance. We invite you to pray with us as the interns continue their journey, and please stay tuned to our website for more updates from El Salvador as they come. In 2002, G.O.D International offered it’s first ever Summer Internship. That summer was full of challenges and inspiration with the first dozen interns, and it was the beginning of 7 straight years of internships that would do the same for nearly 200 people. Throughout those 7 years, our interns traveled internationally through Mexico, Jamaica, Kenya, Uganda, The United Kingdom, Guatemala, The Philippines and Hong Kong (in different combinations in different years). The summer internship, by definition, is an intensive journey to discern the call of God upon one’s life regarding the possibility of entering into full-time ministry. This includes immersion in the word, worship, prayer, and service for 7-weeks, and in our experience, has been life-changing for many individuals. This Summer Internship has been the catalyst for many of the participants who are now involved in full-time vocational service to the LORD with G.O.D. International. Summer Interns are given an opportunity to come face-to-face with injustice on the international scene (often for the first time). In addition, they are given the chance to witness a community of individuals who have devoted their lives to God in service of the poor and marginalized. This can be a phenomenal experience in and of itself. This year we are blessed to host 22 interns from 9 states and 10 denominational backgrounds. These interns will participate in 3 weeks of service and training at our headquarters in Nashville, Tennessee. In addition to prayer, worship, and study of the Word, they will host ‘Camp Skillz’—a day camp incorporating sports, dance, gardening, art and other basic skills to foster character development. This camp has been offered to refugee children from nearby neighborhoods, thus beginning the interns’ international encounter before they even leave the States. The team will then continue on to El Salvador where they will be assisting our development team with building housing structures as well as learning the culture, language, and prevalent needs of the Sitio Nuevo area. The interns will then travel to North Carolina where they will help facilitate service projects for a high school youth group. We invite you to pray with us for this special group of young people who are embarking on a wonderful opportunity. Our theme for the summer is the same as 10 years ago when Summer Internship began: ‘Be Mo’ … like Jesus.’ We hope to inspire these young people to live lives like Jesus did—without selfish ambition or conceit, but rather exhibiting humility as they consider others above oneself—particularly the poor who are so rarely considered. In doing this, we know we can share a mind with Jesus whom we call Christ our Lord. Philippians 2:3 Do nothing from selfish ambition or conceit, but in humility regard others as better than yourselves. 4 Let each of you look not to your own interests, but to the interests of others. 5 Let the same mind be in you that was in Christ Jesus, 6 who, though he was in the form of God, did not regard equality with God as something to be exploited, 7 but emptied himself, taking the form of a slave, being born in human likeness. And being found in human form, 8 he humbled himself and became obedient to the point of death—even death on a cross. Therefore God also highly exalted him and gave him the name that is above every name, 10 so that at the name of Jesus every knee should bend, in heaven and on earth and under the earth, 11 and every tongue should confess that Jesus Christ is Lord, to the glory of God the Father. The Bible teaches that children are a blessing, and at G.O.D. Int'l we have experienced great blessing by the addition of many children over the last ten years. We have grown from one child in 2005 to the now almost 80 children! It is our desire to provide quality, affordable childcare to the parents that work in full time service with G.O.D. Int'l. We are praying and asking the Lord for favor as we move towards the purchase and licensing of a childcare building in which we can conduct this daycare service for parents who are employed full-time with G.O.D. Int'l, studying to develop occupational skills, and taking classes at the Institute. We do not take this responsibility lightly, as investing into the next generation is a fundamental aspect of partnering with God to bring LIGHT to all people. We see this not only as an effort we will make while training in occupational, biblical, and missiological studies, but also as a practice that will parallel with our efforts abroad. As a ministry our practice is to begin developing capacities now that we can utilize in the future. We believe that what we do now is what we will do abroad, and the only difference will be the setting within which we do it. Because we send families abroad, we are in need of organized, quality programs to care for, nurture, and educate their children while they serve in different sectors of society. As the committee working towards facilitating these programs, we are excited to embark on the way we believe God is leading us. We believe God for the support we will need from him as we prayerfully consider the way in which this daycare will take shape and how it can best serve families as they serve the Lord. We ultimately hope that through the expansion of building space we will be able to provide quality, affordable childcare to low-income and single parent families in our immediate vicinity. The burden we feel for the education and care of children is not limited to those that benefit G.O.D. Int'l as full time employees. In contrast, in the future we hope to have the facilities and manpower to offer what we believe can be the best daycare program in our area. Please pray for the discernment of our organization’s leadership and the leadership of the current children’s programs we have in place as we take steps in this new and exciting direction. If you would like to assist in meeting this need please call 615.832.2470 or use link below to donate.